A Congressional hearing on gun violence began boiling over after Republican Florida Congressman Matt Gaetz suggested that illegal immigration poses a greater threat to the public than guns. WASHINGTON, DC -- A Congressional hearing on gun violence began boiling over after Republican Florida Congressman Matt Gaetz suggested that illegal immigration poses a greater threat to the public than guns. "I hope we do not forget the pain and anguish and sense of loss felt by those all over the country who have been the victims of violence at the hands of illegal aliens. HR-8 would not have stopped many of the circumstances I raised, but a wall, a barrier on the southern border may have, and that's what we're fighting for," said Matt Gaetz. The Florida Congressman's claim prompted outrage from the fathers of two victims of last year's massacre at Marjorie Stoneman Douglass High School in Parkland, Florida. Manuel Oliver and Fred Guttenberg repeatedly interrupted Gaetz as he argued against a bill that would require background checks for all gun sales, and actively campaigned for a border wall. "There will be no comments or demonstrations please," said the committee chairman, Democrat Jerry Nadler, issuing several warnings for the men to stop interrupting before Democrat David Cicilline of Rhode Island posed this question to committee leaders: "Is there any committee rule that prevents a member of Congress from reciting false statements in a committee hearing?" Cicilline's remarks prompted applause from some and a rebuke from a ranking member, Republican Doug Collins. "Can I make a point of order that the gentleman's words were unparliamentary because they implied the lying or the falsehood of a member." 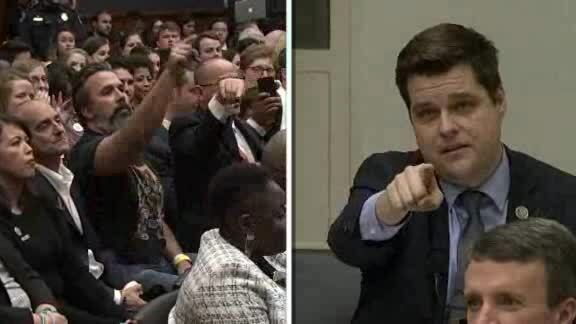 The episode concluded with Gaetz calling for the Parkland fathers to be removed from the hearing. “Is there a process in the committee whereby if the very same people are repeatedly interrupting the time of the members, that those people will be asked to depart the committee, or is there?" Chairman Nadler denied Gaetz's request and later criticized the Congressman on CNN. "He was beyond terrible in what he was saying. We were sitting in a room full of parents of children murdered at Parkland high school." Gaetz told the Sun Sentinel that he did not know that Oliver had lost a child in the Parkland shooting, but would react the same way if he did, noting: "I don't think anybody, regardless of tragic circumstances, can expect to come to a Congressional hearing and take it over with a series of interruptions." Both Parkland parents were also at President Trump's State of the Union Address Tuesday. Trump did not address gun violence or mass shootings in the U.S., but he did honor a first responder and a survivor of the Tree of Life synagogue shooting in New Jersey.